With the rising trend of outsourcing of services, France is expected to witness lucrative opportunities in the market for facilities management over the forthcoming years. Expanding at a healthy CAGR of 9.80% between 2016 and 2024, the opportunity in the France facilities management market is likely to increase from US$48.02 bn in 2015 to a value of US$110.42 bn by the end of the forecast period. The increasing adoption of outsourced services and the augmenting demand for standardization of these services are projected to act as the key driving factor behind the growth of the market for facilities management in France over the next few year. Hygiene and prevention, security, support, cleaning, catering, property, facility/property management, and logistics and production are the main services offered by the players operating in the market for facilities management in France. Among these, the support services segment is likely to increase at the most prominent growth rate in the coming years due to the increasing need for maintenance and support services in various industries. The security services segment, which has been leading the overall market, is expected to maintain a strong rise in this market, retaining its dominance over the forecast period. This imminent growth in the demand for security services can be attributed to the escalating need for manned guarding and to access control services across a number of industries in France. Other facilities management services, such as catering services, cleaning services, and hygiene and prevention services will also see a healthy progression in their adoption in coming years. Facilities management services find a widespread application in the pharmaceuticals, business services and IT, healthcare, food and beverages, industry and manufacturing, public administration, hotel, leisure, and entertainment, energy and resources, retail and wholesale, and transportation and logistics sectors in France. Of these, the business services and IT sector has emerged as the key contributor to this market and is expected to remain so, rising at a CAGR of 10.60% during the forecast period. The increasing focus on the sustainable environment in businesses across France and the growing importance of technological advancements in medical and healthcare industries are the key driving forces behind the increased adoption of facilities management services in the business services and IT segment in this country. Apart from this, the hotel, leisure, and entertainment segment, which held the second position with nearly 11.7% of the overall market in 2015, is also projected to provide lucrative growth opportunities to facilities management services vendors in France over the next few years. The growing uptake of linen management, cleaning services, catering, and maintenance and logistic services in the hotel, leisure, and entertainment industry is likely to reflect positively on the overall growth of the France market for facilities management. 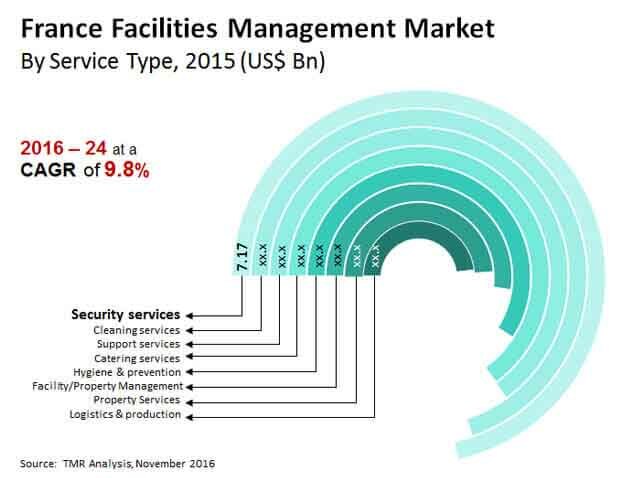 With the rising demand for cost reduction and the growing focus of various industries on core services is leading to the increasing presence of facilities management service vendors in France. Some of the key providers of these services in France are ATALIAN Global Services, Mace, Cresa LLC, ISS World Services A/S, and Sodexo Inc.
Facilities management services are support and maintenance services required across multiple industries to enhance the quality of core business processes and increase their value. The France facilities management market is experiencing growth owing to factors such as rising adoption of outsourced services and growing demand for standardization of services across the country. The report provides an in-depth analysis of the France facilities management market for the period 2014–2024, wherein 2015 is the base year and the years from 2016 to 2024 is the forecast period. Data for 2014 has been included as historical information. The report covers all the prevalent trends playing a major role in the growth of the facilities management market over the forecast period. It also highlights various drivers, restraints, and opportunities expected to influence the market’s growth during the forecast period. The study provides a holistic perspective on market growth in terms of revenue estimates (in US$ Bn), across France. This research study on the France facilities management market provides a detailed analysis of various service types of facilities management available in the market. Based on the service type, the market is further divided into the facility/property management (workplace mgmt., risk mgmt., facilities administration), cleaning services, security services, property services, catering services, support services, hygiene & prevention and logistics & production. Based on the service sourcing, the France facilities management market is categorized into in-house services and outsourced services. On the basis of industry, the market is segmented into pharmaceuticals, health care, business services and IT (corporate), public administration (government and public sector), industry and manufacturing (manufacturing), hotel, Leisure, and entertainment, retail and wholesale (retail and commercial), energy & resources, food and beverages and transportation and logistics. The report provides analysis of the France facilities management market in terms of market estimates and projections for all the segments across France. It also covers profiles of major players, their growth strategies, their market positioning, and the various recent developments, and includes market positioning analysis of key players operating in the facilities management market. Further, it includes a comprehensive coverage of the underlying economic development factors under the key trend analysis section. To depict holistic view of the France facilities management market, ecosystem analysis is included in the report. The section describes current supply chain model and potential impact of forward – backward integration. It aims to provide a comprehensive and in-depth analysis of the facilities management market across France, which is segmented into service types, service sourcing and the end-use industries. The report also provides level key trend analysis for different segmentations included. The report highlights the competition matrix of the facilities management market, positioning all the major players according to their geographic presence, historical roadmap, competitors, market position, key recent developments, and segment growth. The matrix has been designed to show comparative strength of players active in the France facilities management market. For market positioning of players, area serviced by them has been considered as major parameter considering variation in service contracts, in particular for integrated service offerings. Also, distinct representation of market competition in terms of market shares of global and regional/local players has also been included. Under the company profiles section, the report provides an overview of the players operating in the market, the strategies adopted by them to gain competitive advantage, the annual revenue generated by them in the past two or three years, and their relevant business segment revenue. The report also provide market share analysis of the France facilities management market. The key players profiled in this report include ISS World Services A/S, Sodexo, Inc.., Mace, ATALIAN Global Services and Cresa LLC.